This page shows you how to run and debug your App Engine flexible project in a Jetty server running on your local computer. Install the Eclipse Jetty Integration from the Eclipse marketplace if you have not already done so. Select your flex application in the Project Explorer. Select Jetty Webapp in the left panel. 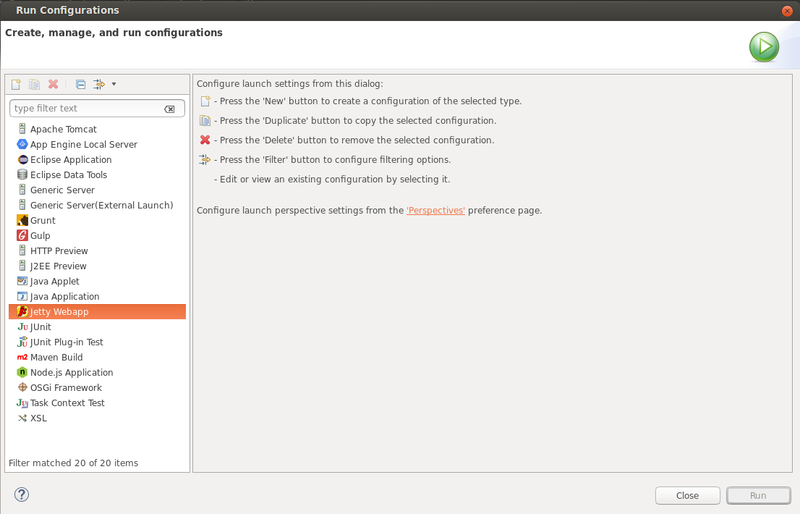 Click the New launch configuration icon. The run configuration Name autofills with the project name. Fill in other fields as needed. For more information about the configuration options available when creating run and debug configurations, refer to the Eclipse Jetty documentation. After creating the run configuration, you can launch your project on the Jetty server by selecting Run > Run As > Run with Jetty. Your project is available at http://localhost:8080/, or on the port you specified in the run configuration. You can debug your project by selecting Run > Debug As > Run with Jetty. To stop the Jetty server, click the Terminate button (the red square) in the Console toolbar for the Jetty output. Once you're happy with how your application behaves locally, you can deploy it to the App Engine flexible environment.